Yes, you read that right, a burn – not a bun. Did you ever burn yourself taking toast out of the toaster? Or pick up a still hot pot and get a little burn? I call them hotspots. I have, too many times to count. It always smarts for a few days, nothing serious, but it’s annoying. Besides a few minutes running it under cold water, there’s not much you can do for them except wait for it to go away. Then, the other day, I saw this pin. Well, the other day, my daughter was making toast and burnt her thumb getting it out. Nothing serious, just a little hotspot on the side of her thumb. So, I tried putting some mustard on it. Toaster Burn? Put a little mustard on it! We let it sit for about 30 seconds and rinsed it off with water. And I’ll be darned, it actually worked! She said it didn’t sting anymore. So, there you have it – mustard does take the sting out of little, not-serious burns. Obviously, don’t try this on anything more than a hotspot. I wonder if this works on sunburn? What do you use on hotspots? Disclosure: I am not a doctor, so this advice is not meant to save lives, or fix anything other than tiny burns you get because you are clumsy like me and burn yourself when you take the toast out. Try at your own risk. 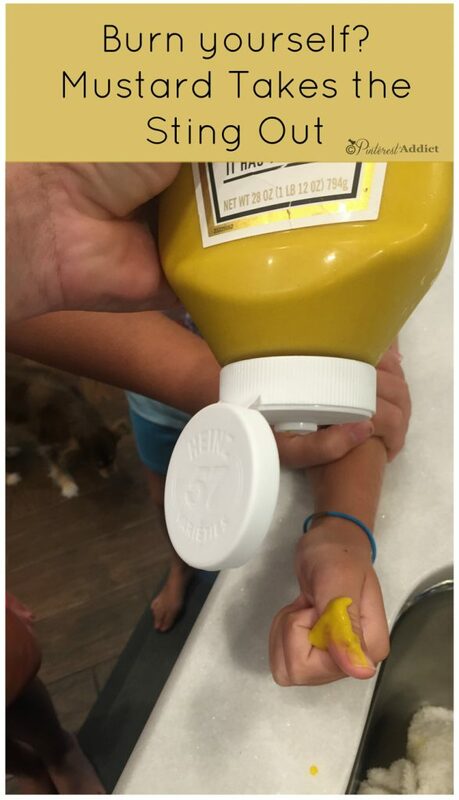 Don’t try if you are allergic to mustard, obviously. Are we clear on that? Okay? Okay. Thanks! Sour cream works great too! Really? I’ll have to try that next! 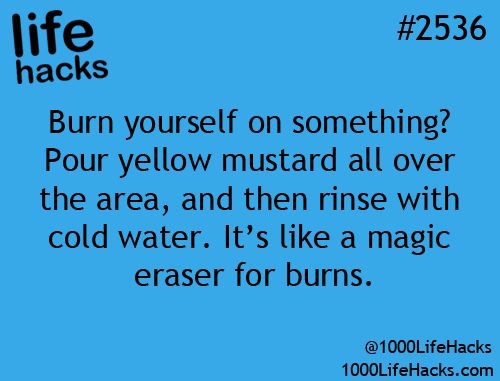 I used yellow mustard on a bad burn from an oven rack. Worked great!